Good morning! 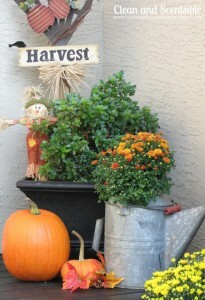 I hope you are all enjoying the changing of the seasons! The leaves are starting to change colors and even though it is still quite sunny during the day, the air definitely has that fall coolness to it. It’s such a beautiful time of the year! 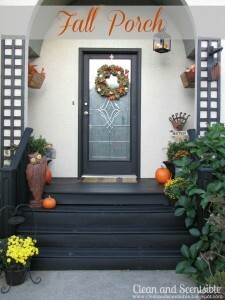 I have always loved decorating the front porch for fall. It’s probably one of my favorite things to decorate – I just love the colors of the Mums and all of the different shapes of the pumpkins. 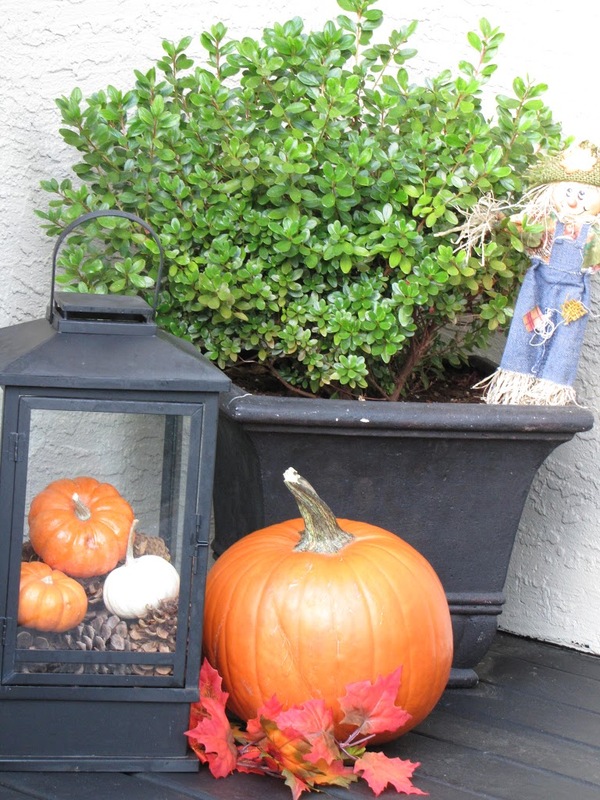 We will be adding a lot more pumpkins to the porch after our trip to the pumpkin patch in October but Matthew and I got a head start to our collection when we were out at the apple farm last weekend. 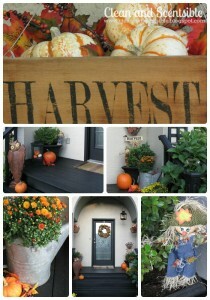 I re-used the wood planters from my summer porch to hold some of the smaller pumpkins and leaves. 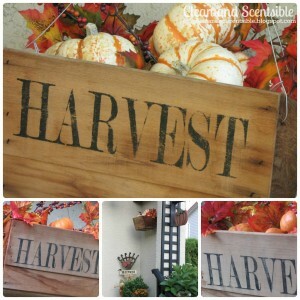 I used my Silhouette to create a stencil, painted on the Harvest, and just sanded away. 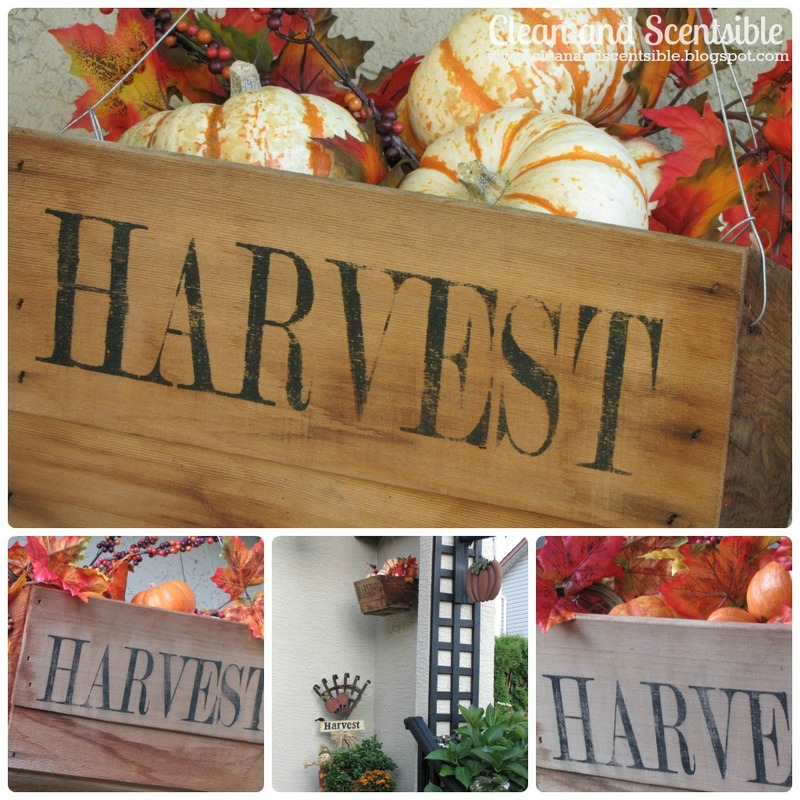 I added a bunch of newspaper to the bottom of the basket so I just needed to fill the top up with pumpkins. 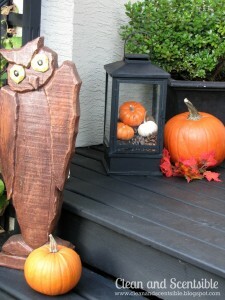 My two new purchases for the porch this year were this wooden owl that I picked up from Home Sense. 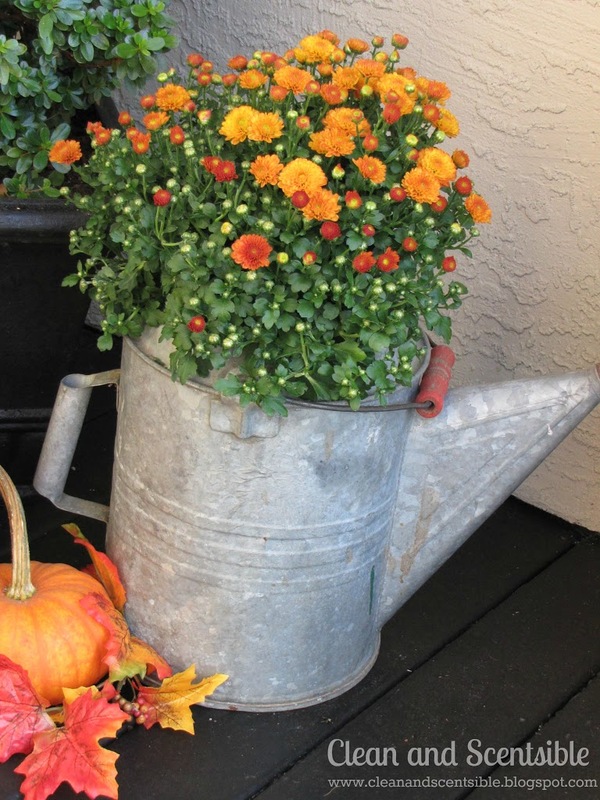 And this old watering can that I found at a thrift store when we were camping a few weekends ago. 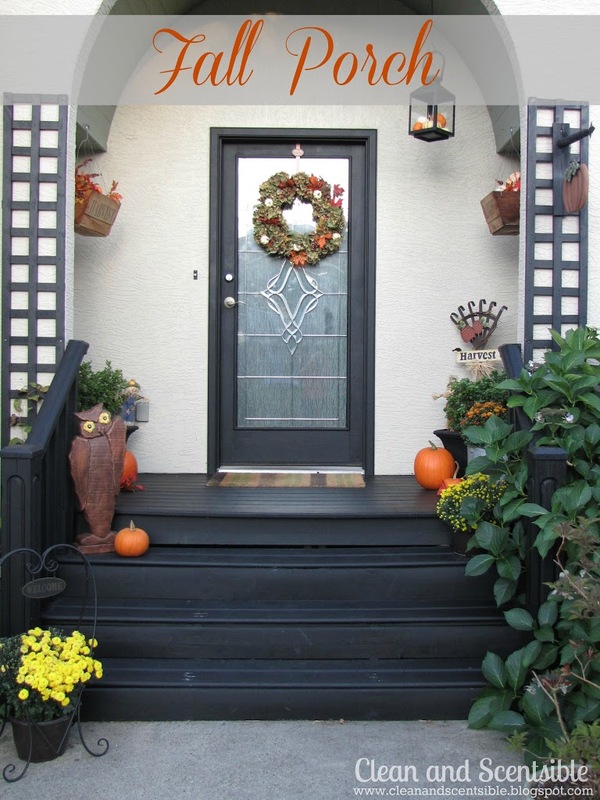 So there’s the front porch! Next week I’ll actually invite you inside and give you a little house tour! 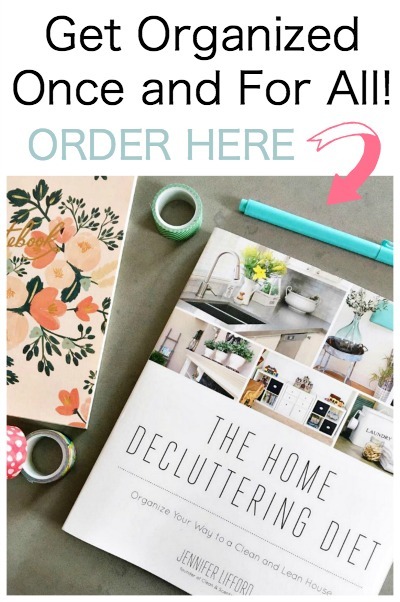 I linked up with Funky Junk Interiors, Liz Marie Blog, At the Picket Fence, Live Laugh Rowe, The 36th Avenue, Delightful Order, The Shabby Creek Cottage, Stone Gable, Uncommon, Thrifty Decor Chick, Tip Junkie, Today’s Creative Blog, Home Stories A to Z, Skip to my Lou, Under the Table and Dreaming, Alderberry Hill, Positively Splendid, I Heart Naptime, Be Different Act Normal, Tatertots and Jello, The Frugal Girls, Tidy Mom, Crafty Scrappy Happy, Chic on a Shoestring and Somewhat Simple. 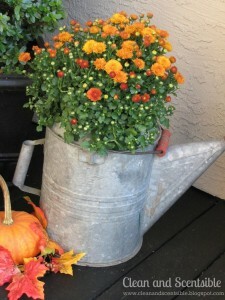 I love the watering can holding mums – so pretty! Stopping by from 36th ave. So welcoming! Love the idea of the mini pumpkins in the lantern. Just found your blog through the 36th Avenue Link Party. 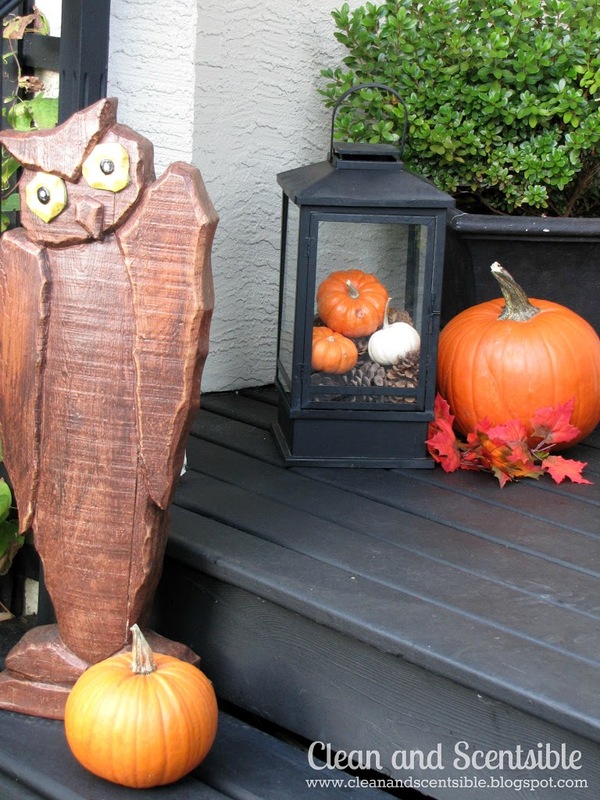 Love love love your fall porch! You’ve inspired me to decorate mine this weekend. Have a great weekend!